I don't know how to begin describing how my trip went. Even when I was there, I couldn't explain to myself what I was feeling at the moment. I think one of the reasons why my trip became one of the best trips is Nika. My oh my, you're no boring person, my friend! 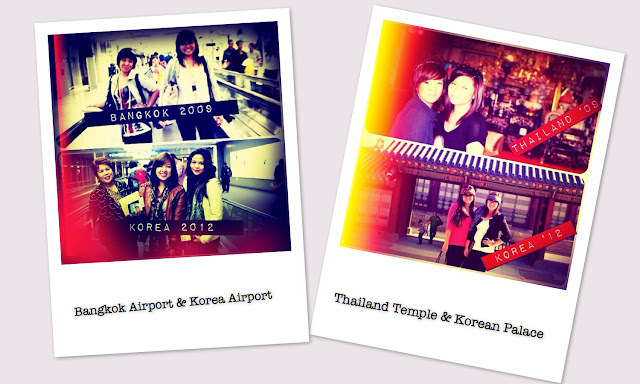 In case we haven't mentioned it enough, our first trip abroad was in Bangkok, last 2009. That was my course's thing, but the chairperson allowed her to join because we needed at least one more person to come or else we'll pay more. The Bangkok trip didn't seem like it was a school thing because after attending a Culinary competition for approximately two hours, we already had our free time. Free time means shopping. Just imagine 2-3 days of shopping with your best friend abroad...how would you feel? This year, we went to Korea for no reason (except for the fact that we both just graduated and we always wanted a part two abroad). It all started with one ride to school. Tina: Nika parang gusto kong pumunta ng Korea. Tara punta tayo! Nika: Oh my God Tina pupunta kami nila mama sama ka nalang samin! ...and there it was. One random conversation became the real thing. It's not that we think we're so cool; travelling abroad together and stuff. We just really wanted to go.